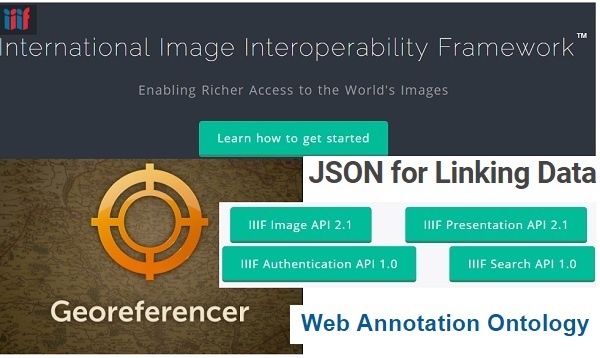 A growing community of the world’s leading research libraries and image repositories have embarked on an effort to collaboratively produce an interoperable technology and community framework - - The International Image Interoperability Framework (IIIF) - - for image delivery. The IIIF encompasses a large and growing community of interested individuals and organizations and a Consortium (IIIF Consortium or IIIF-C) of institutions dedicated to leading and sustaining the IIIF. To give scholars an unprecedented level of uniform & rich access to image-based resources hosted around the world. welcomes any organization or individual interested in adopting the IIIF, developing software to support it, or giving feedback on the effort to GET INVOLVED. is a set of shared application programming interface (API) specifications for interoperable functionality in digital image repositories. gives users a rich set of baseline functionality for viewing, zooming, and assembling the best mix of resources and tools to view, compare, manipulate and work with portable–shareable, citable, and embeddable images on the Web. HERE you will find a quick-start guide for image repository managers and engineers who are interested in making their image repository interoperable, or just experimenting with IIIF.